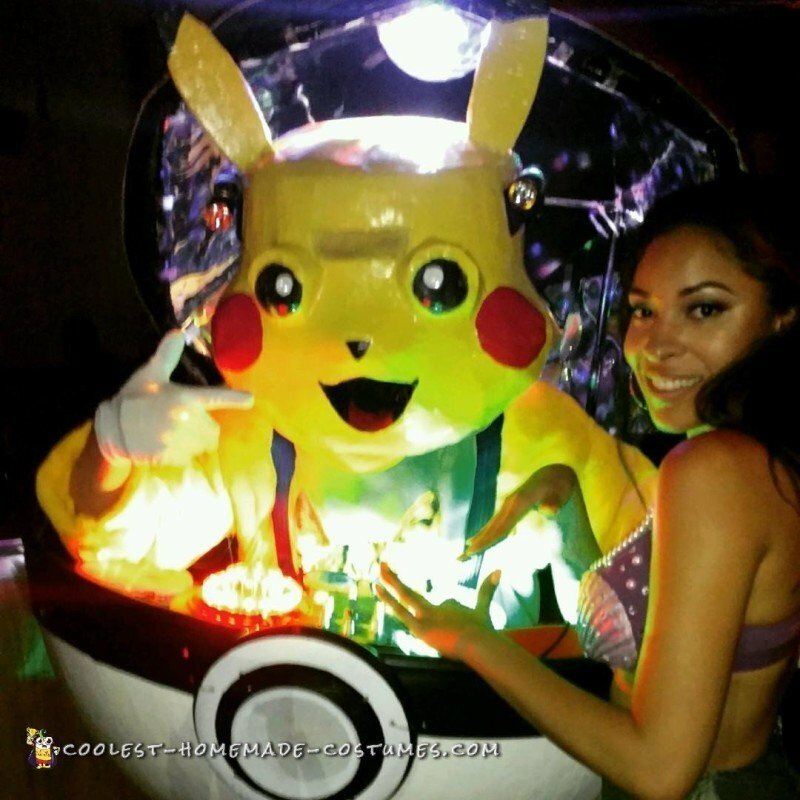 My 2016 Halloween DJ Pikachu Pokemon costume idea came to me in July with the release of the popular game Pokemon Go! 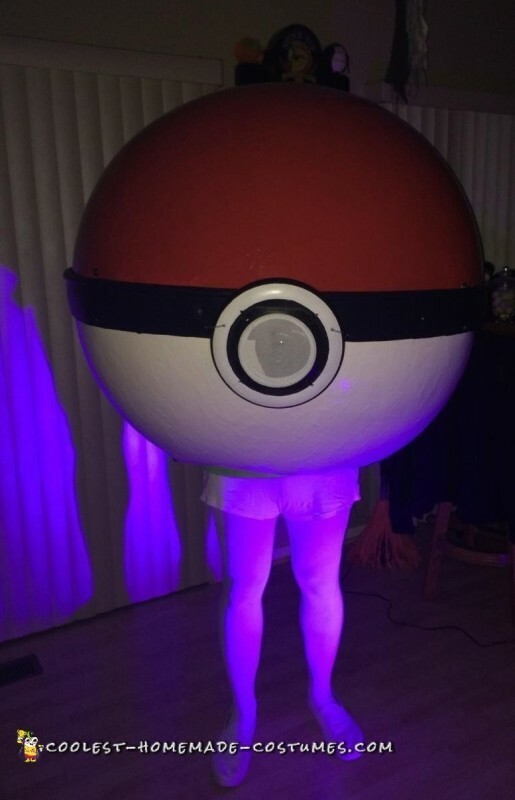 Growing up I watched the Pokemon cartoon, and with all the hype of Pokemon Go it inspired me to create a Pokemon themed costume! 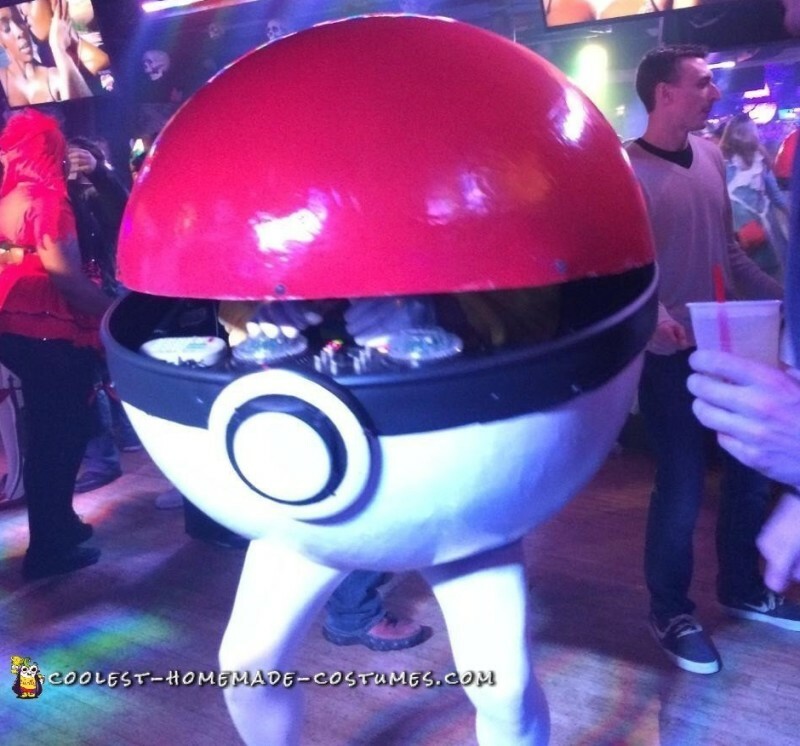 I knew from the start I wanted to be Pikachu and somehow incorporate the Pokeball into the costume. 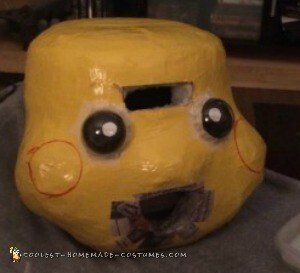 I eventually came up with the idea to turn the Pokeball into Pikachu’s own little DJ booth! Inside the Pokeball Pikachu has his own DJ controller with moving lights! Under the DJ controller there is a stash of Pokeballs that I used to throw out to the crowd. 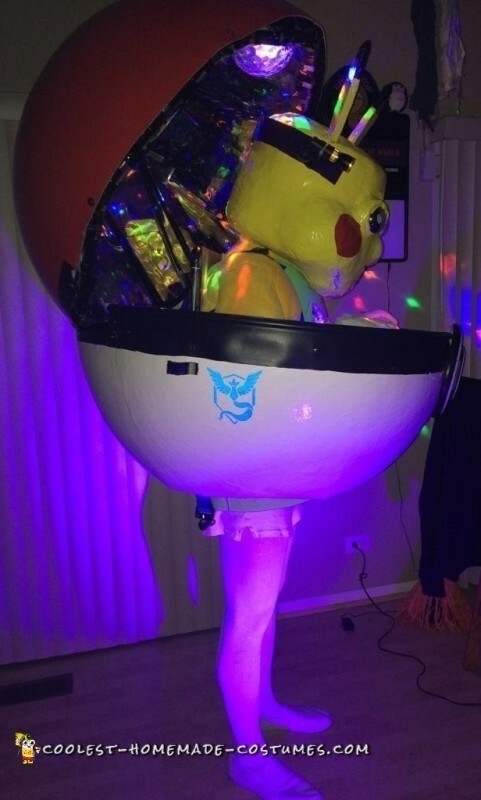 The top half of the Pokeball was covered with mirrored panels, so when the top light is turned on it creates a light show for anyone within 10 ft of DJ Pikachu Pokemon costume! 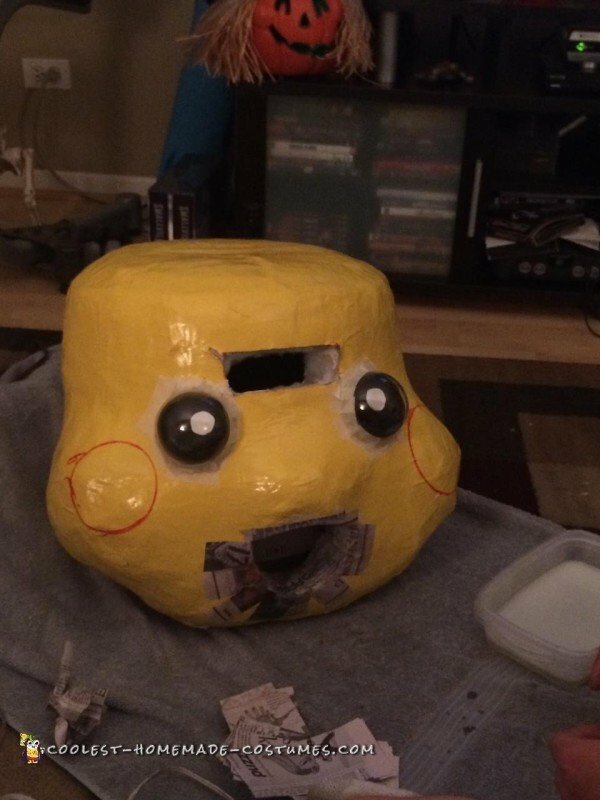 I also installed a speaker system that played music through the front of the Pokeball. You can’t be a DJ without music! 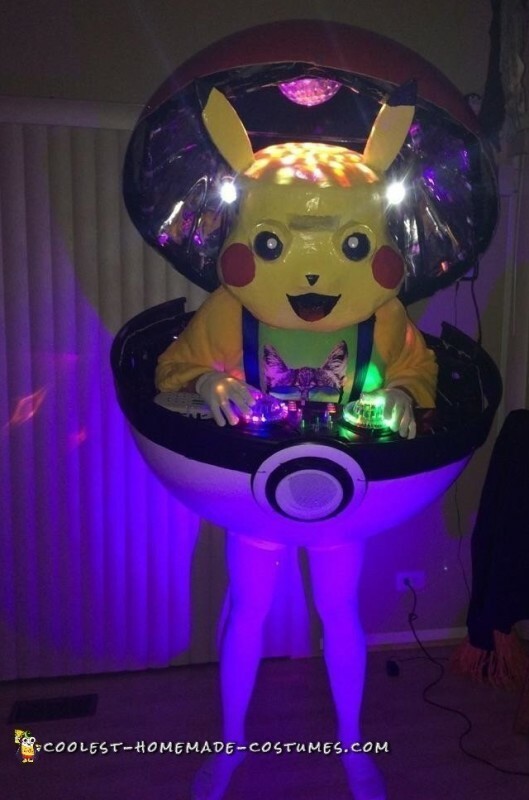 Overall the DJ Pikachu Pokemon costume was a great success! Multiple people pulled their cars over to get a picture with DJ Pikachu as I walked down the street playing music. DJ Pikachu caused small dance parties to break out where ever he went! This is my 5th year visiting Coolest Homemade Costumes! I can’t wait to start working on ideas for next Halloween! 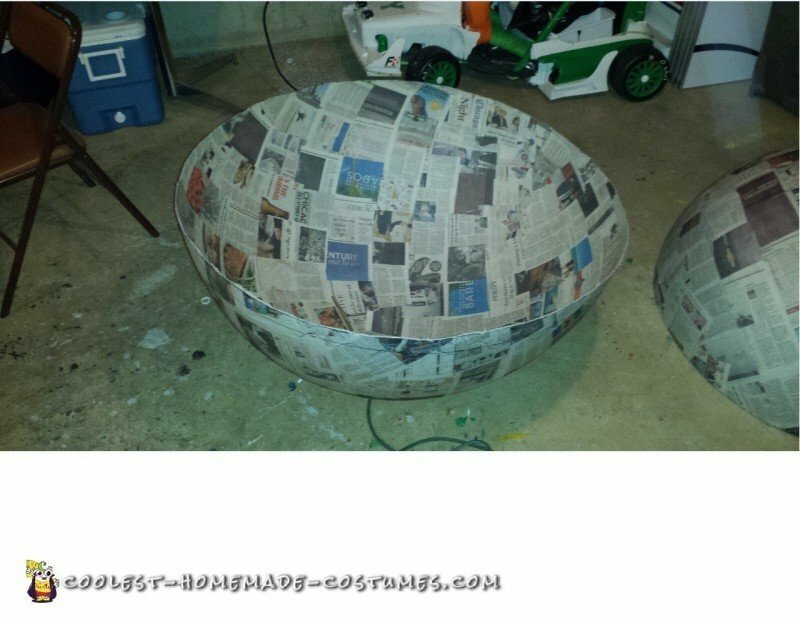 The base of the ball was an inflatable 52″ beach ball. 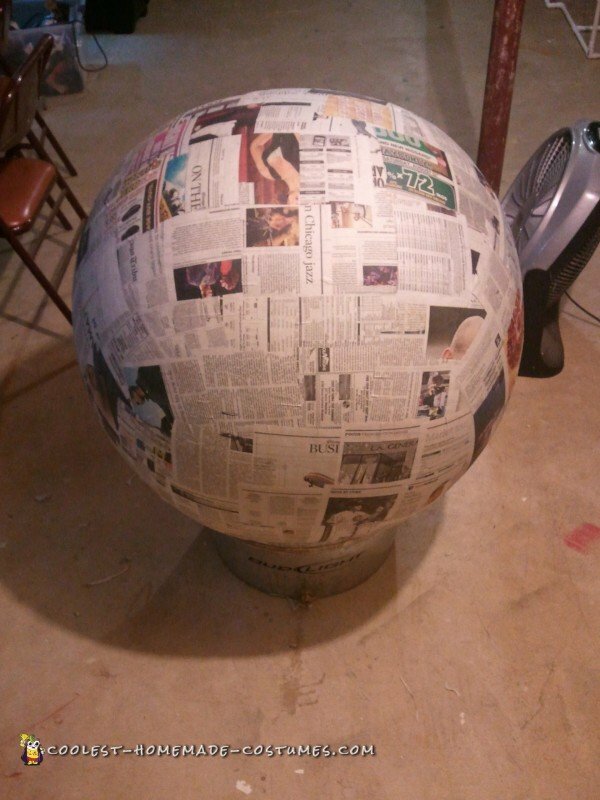 I covered the ball in 20 layers of paper mache to create the hard shell of the ball. Each layer took 45 minutes for a total of 9 hours! This was the most time consuming part of the costume! 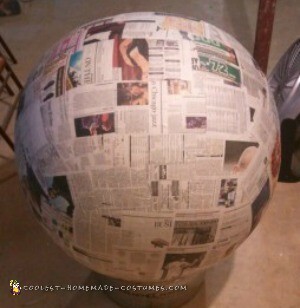 Once the ball was finished I cut it in half and added a PVC skeleton to the inside of the ball. 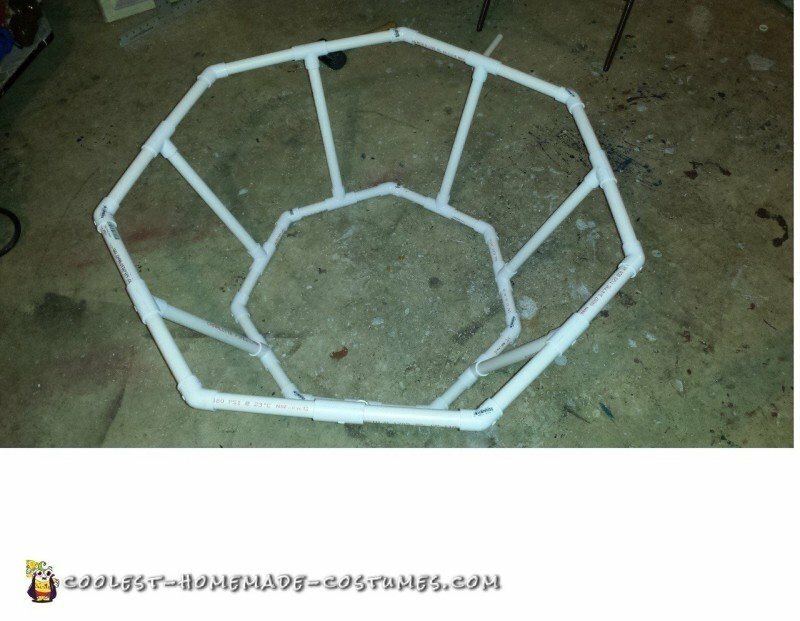 For the bottom half of the ball I sued 3/4″ PVC, and for the top I used 1/2″ PVC. The PVC skeleton helped hold the shape of the ball, and was the base I needed to allow me to wear the costume as a backpack. All of the lights and speakers are run off a portable 300 watt battery pack. At 12 lbs the battery pack made the costume a little heavy, but it was the key power source for the whole costume! To create the front butting of the ball I used a Frisbee. I cut out the center and put a speaker cover over the middle, so the music could come out clearly. The black strip around the ball is used to divide and edge gardens. 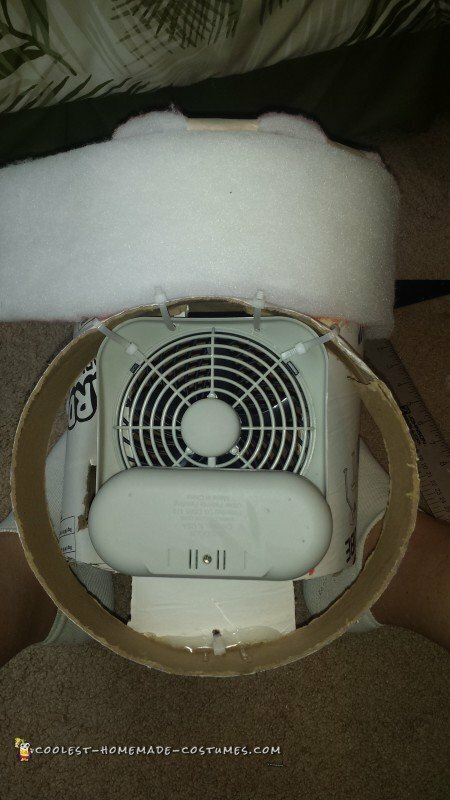 The base of the head started with a 10′ cement tube. I wrapped the tube in a few layers of 1/2″ foam. Once I had the general shape of the head I covered it was masking tape, and used 10 layers of paper mache to create the rest of the facial features. I built a small battery fan in Pikachu’s nose to keep me cool when I was wearing the mask. The eyes are a clear plastic christmas ornament ball cut in half. I used molding wire mesh to cover up the main eye hole I looked through. Here is a list of all the materials I used to create DJ Pikachu!